Scotland is one of those places that is just magical. Bagpipes playing, men in kilts, Scotch, Castles, Outlander. There are so many places to visit in this Scotland travel blog and are included in this Scotland itinerary 7 days. Here is a sample itinerary for each day during this Scotland one week itinerary. Drive times and highlights are listed below under each day. Day 1 – start in Edinburgh and head to St Andrew’s before heading north to Inverness for the night. Day 2 – will see you travel along Loch Ness to Glen Coe and staying at a Country Lodge along Loch Ness. 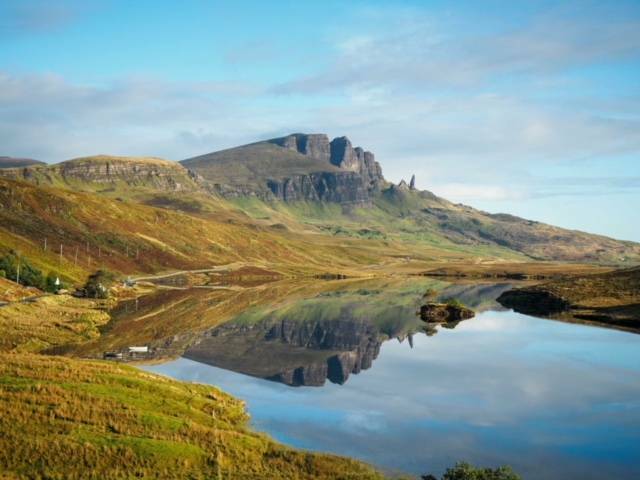 Day 3 & 4 – will see you travel to Isle of Skye and visit Old Man Storr and the fairy pools. Day 6 – will see you travel to Stirling before heading back to Edinburgh. Edinburgh is my favourite city and there is so much to do there. I lived in Edinburgh for a year. 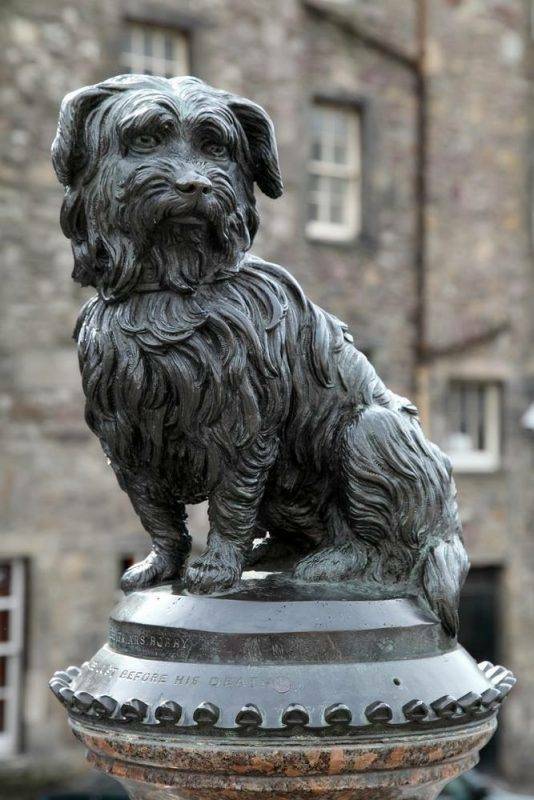 Check out this guide on things to do in Edinburgh. Scotland is my favorite country in Europe not only because I studied abroad there and lived in Edinburgh for a year but because of the beauty of the country. It had been 15 years since I had been to Scotland and lots of things had changed but the landscapes are still absolutely stunning. I have been to the Highland in August, September, October, November and May – don’t worry, it is sure to rain no matter what time of year but that just adds to the mystique of the place and improves the waterfalls and greenery and Scottish Thistles. On this road trip we go as far north as Inverness and then west to Isle of Skye before heading back to Edinburgh. This was my first time driving in Scotland. I was a little nervous at first but it really is the best way to Travel Scotland. Tip 1 – My first travel tip for Scotland is to adjust to the time in Scotland. We had been in London for four days before we arrived in Scotland so we were no longer jet lagged. I recommend spending at least a day in Edinburgh before you drive especially if you are not used to driving on the left. As I live in New Zealand I am used to driving on the left. Tip 2– Scotland in a week – rent a car. We rented a car through Europa at the Edinburgh Airport and everything worked smoothly. We had a newer small SUV and we were used to everything except when it would shut down when the car was at a complete stop. I found this very bizarre and kept thinking I had stalled the car as it was a manual. I spoke to my friend there and they let me know this is normal (it’s a way to save on petrol). Tip 3 – You will not have cell phone reception in most of the highlands. This is not such a big deal unless you are planning to use your phone as your GPS. My recommendation is to down load the app maps.me and then download the map of Scotland so you can use it off line. This was brilliant for us as we also used it for rest stops and restaurants. Tip 4 – you should absolutely book all of your accommodation before your trip. I had done six of our seven nights ahead of time and I kept checking to see if there were any hotels available for the one night. We did find somewhere but do remember Scotland in the high season is booked out. We left early from Edinburgh as our first day’s drive was a long haul. We arrived in St Andrews before lunch. St Andrews can easily be done as a day trip from Edinburgh. St Andrews is the birth place of golf. We went to see the Old Course, the club rooms, and hit some balls at the driving range. We took some obligatory pictures on the bridge on the 18th hole and then headed to lunch. St Andrews is a cute little town and of course William and Kate went to University there. It’s a great little place to walk around, grab a bite to eat and stretch your legs on a long road trip. After spending a few hours in the town we decided it was time to head north to Inverness. It is a three-hour drive to Inverness on the A9 which is a dual carriage way. The only problem is that there are no rest stops along the way. This is where using an app like maps.me is useful as you can put in things near me and choose from cafes or bathrooms. Just a note that bathrooms are not free in the UK. Most places you will need to purchase something in order to use the restrooms. We also stopped at a petrol station at 4pm and it had already closed. We arrived in Inverness around 6pm at our BnB which was just outside the city centre. We stayed at Crown House which was a lovely place to stay with a large room and en suite. For dinner neither of us were up for going out to eat so we went for a short walk to the supermarket and picked up some food and snacks for the next day. Our BnB included breakfast and we each had a full Scottish Breakfast the next day. After breakfast our first stop was to check out Loch Ness and Urquart Castle which is less than an hour away from Inverness. Urquart Castle is an iconic spot and a beautiful location. The castle is a ruin but you can still walk around a explore the area. There are also lots of places to pull over up and down Loch Ness for the best photos. We started off the day pulling over at every stop! Its so worth it though because the area is so beautiful. After hours staring at the lake and stopping off to take pictures we were at the southern tip of the lake and Fort Williams. We stopped for lunch there and took a look around the town. Now here is where we detoured from our original plan which was to continue on to Isle of Skye which makes lots of sense but we went onto Glen Coe as we were attending a Christening on the Isle of Skye the next day. So off to Glen Coe we went with everyone else it seemed. For those unfamiliar with Scottish terminology, glens are what we’d refer to as valleys and lochs are what we would call lakes. From Fort Williams to Glen Coe we were in one long motorcade of cars. Traffic was bad and there was construction too. To add to that, it had started to drizzle and the clouds had come in. When we arrived at Glen Coe it was the perfect scene from a Scottish day – miserable and wet! We spent awhile driving around and taking photos before heading back to Fort Williams. It is a beautiful stretch but the roads are windy. 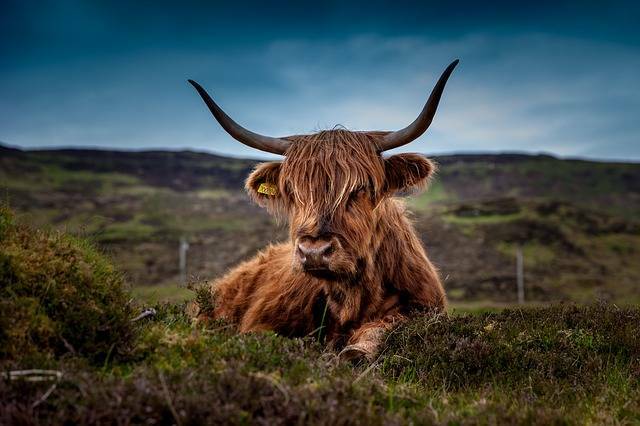 Scotland’s famous highland coo (cow) can be found in just about everywhere in the Scottish Highlands. If you’ve never seen Highland cows, they usually have orange fur, large horns, and shaggy hair with big bushy bangs. You can head further north from Inverness and see them as well. And then we drove back to Fort Williams and onto our hotel called the Inch hotel which was just outside Fort Augustus. This hotel was more of a country house and had recently won awards for best Scottish Inn. IT is a historic country lodge hotel with views of Loch Ness! I first visited Isle of Skye back in the fall of 2000. My host family drove me to Skye for a weekend and we did all these cool hikes and saw beautiful things before they were posted all over Instagram. So when we returned to Isle of Skye I knew the things I wanted to do and where we wanted to return to. Our main reason for visiting Skye though was to attend a christening/baptism. We woke up early and checked out of our beautiful hotel room at the Inch and drove to Portree. Google maps said it would take around two hours but after the traffic we experienced the day before I was a bit worried, especially since the baptism started at 10am. We left about 7am from the hotel and started driving towards Portree. It was a pretty uneventful drive as the roads were definitely quiet that early in the morning. We even had time for a coffee before the ceremony. The baptism was held at a small church in Portree and afterwards we went to a pub and had a meal and of course cake! After the celebrations we went to hike up to Old Man Storr. Now you can see Old Man Storr as you are driving into Portree but it is a bit further north than the city. This is properly the most famous walk on the Island and definitely the busiest. The ‘Old Man’ is a large pinnacle of rock that stands high and can be seen for miles around. It takes around 45 minutes to walk to the pinnacles and then 30 minutes to walk back down. After a long day we decided to turn in early as we had a second day on the Isle of Skye. The next morning, we headed inland to the Fairy Pools. At foot of the Black Cuillins near Glenbrittle are the Fairy Pools, beautifully crystal clear blue pools on the River Brittle. These famous pools entice visitors from all over the world, as they make some great ‘Wild Swimming’ for those brave enough to enter the cold water. For the less adventurous these magical Fairy Pools make some fantastic photos. We were definitely not ready to brave the cold waters so we just took photos. One of the things that makes Scotland so unreal to explore is the unique texture of the ground beneath your feet. Where we’re often familiar with walking across grass fields, dirty paths, rocky outcrops, or mossy forest floors, Scotland is covered by dense tundra-like foliage consisting of grass clumps, heather bushes, and peat. All of which comes together to create a springing ground covering that can leave you feeling as though you’re bounding across one giant mattress. This fascinating combination truly is the stuff of fairy legends. It is common for the very ground you’re walking on to be awash in multi-colored blossoms and a densely woven mixture of different plants, flowers, ferns, and grasses. 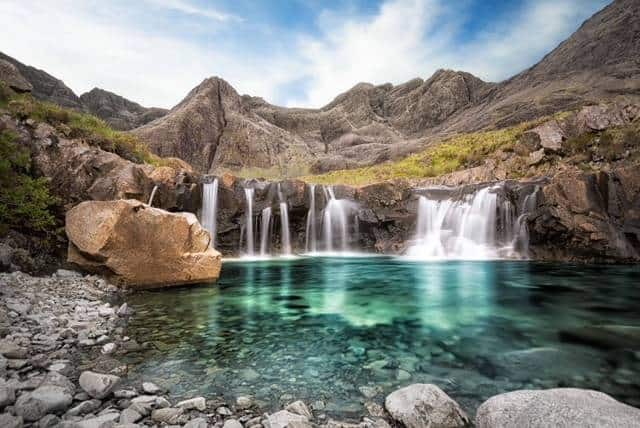 The Fairy Pools themselves are a series of small waterfalls and deep pools filled by crystal clear water which is a combination of rain runoff and snow-melt from the nearby Cuillin mountains. This small stream has cut deep grooves into the bedrock with rich blue crystal clear waters that tease at your senses and almost demand that you strip off your clothes and dive in. Back in the car we headed to Dunvegan Castle on the west coast of Isle of Skye. Built on a rock in an idyllic loch side setting, Dunvegan is the oldest continuously inhabited castle in Scotland and has been the ancestral home of the Chiefs of Clan MacLeod for 800 years. After exploring most of the island we drove back to the mainland to Dornie, famous for the Eilean Donan Castle. This is where the wedding was happening the next day. The quintessential, Scottish Castle – Eilean Donan Castle. When we were first invited to attend our friend’s wedding I asked where it was being held. The answer I received was in Scotland in some castle. I jumped up and said was it called Eilean Donan Castle???? We’re going. This castle holds a special place in my heart. Every time I have been to the Scottish Highlands (I studied abroad in Scotland) I have made sure to visit the castle. It is just so picturesque on the lake but I have never been inside the castle and this was my chance. The wedding was held at 6.30 after the castle had closed for the day. In true Scottish form it had been raining all day long and then we finally got to 6pm and there was a break in the rain. The ceremony was lovely and then we had New Zealand bubbles afterwards inside the castle. I think my favourite moment was after the ceremony and we were walking back over the bridge to the mainland. The light was just stunning and the couple were having their photos taken. And then they started to walk back over the bridge while the bagpiper played in front of them. It was an amazing moment and there were a few tourists around who got quite a show and were taking so many photos. We spent the evening celebrating with the couple before returning to our B&B. We were up early the next day to drive back to Edinburgh. We decided to stop along the way in Stirling and visit the William Wallace Monument as a break in all of the driving. I highly recommend stopping in Stirling. It’s a cute little town with a lot of history. You can also visit the Stirling Castle. We spent some time at the William Wallace Monument before heading back on the road to Edinburgh. Once we arrived in Edinburgh we checked into the Albany Ballantrae Hotel. I loved this little hotel and we were even able to park our rental car there overnight. Edinburgh is the perfect place for a romantic getaway. As we were just behind Princes Street we walked into town and met our friends for a Sunday Roast. One of my favourite things to do when I’m travelling is to go out for a long, boozy, Sunday lunch. It’s a bit extravagant at times but it really refreshes me and gives me some down time from all the driving, chaos of travelling or whatever it is. And just like we had finished our Scotland road trip! 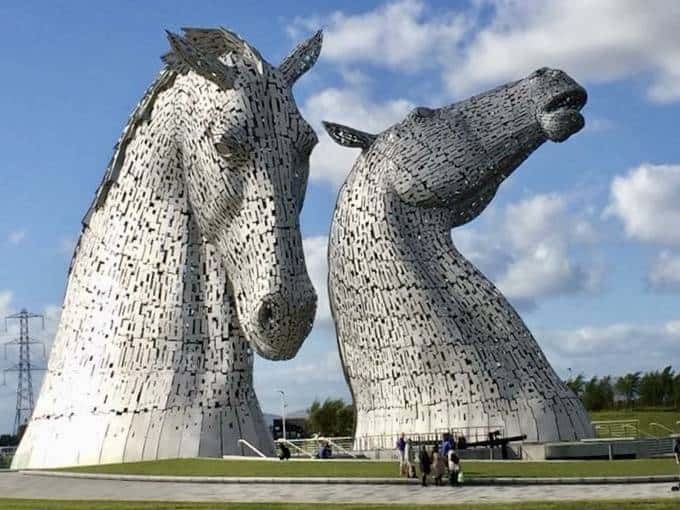 This Scotland Itinerary 7 days can easily be turned into a 7 day self drive tour Scotland. I plan to write more about Edinburgh itself as the city really does have a lot to offer. Check out this post if you are heading to Loch Lomond. You can check out this post on hotels in Edinburgh. Those photos are definitely inspiring me to go! I only live in wales so really i have no excuse not to go soon! Firstly maps.me rules! Amazingly helpful in China where googlemaps doesn’t work. 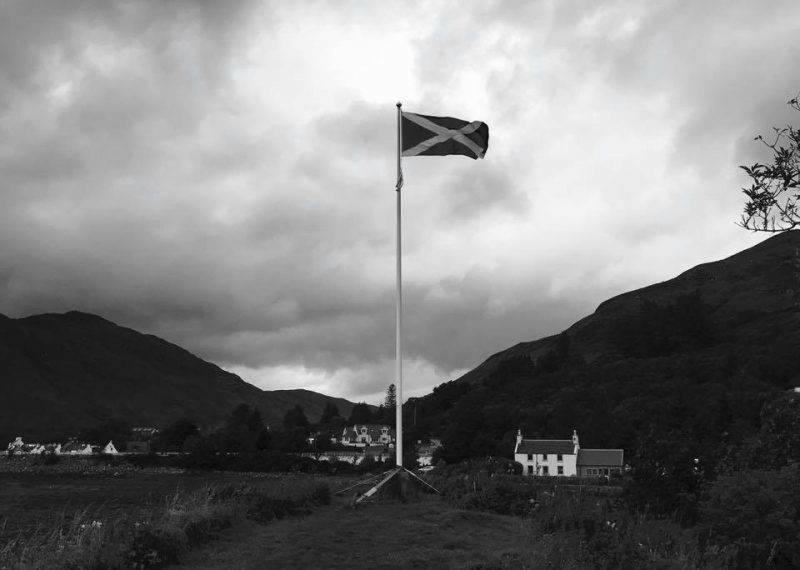 Secondly your photos are absolutely stunning and make me want to go to Scotland even more than I already do, it is 15 years since I was last there, too long! Scotland is a stunning country, but not one I’ve visited much! I’m hopefully going up there for my dad’s birthday this year! Magical indeed! As we house sit here in Opotiki – we’ve a sit right by your hometown in 3 weeks – we cannot help but think it is a bit like NZ. Especially the dramatic landscapes. So inspired, so gorgeous, so mystical. Plus….castles. You really cannot beat that. Amazing experience and rocking post! Those pictures are so moody, I love it! It’s refreshing to see beautiful holidays pics despite the clouds. Amazing. Your photos are so beautiful! Love this itinerary! Thanks for the tips and ideas. Scotland looks MAGICAL!! I hope to go soon, and I’ll definitely be doing a roadtrip. This is super helpful! A wedding held in Eilean Donan Castle, that sounds amazing! I’ve visited Scotland once last year, and I’m dying to return soon! Half my family come from Scotland and I love that you seem to have really enjoyed your trip. For me, Edinburgh is one of the most magical cities in the world. Skye is also stunning and for another trip I’d recommend Mull and the Western Isles (Iona, Staffa, Trellick isles). Indeed a road trip is the best way to appreciate Scotland! That scenery would make me want to stop all the time. Your photos are breathtaking!! The fairy pools are inviting, I will definitely dare to swim no matter how cold. It would be really a memorable experience. 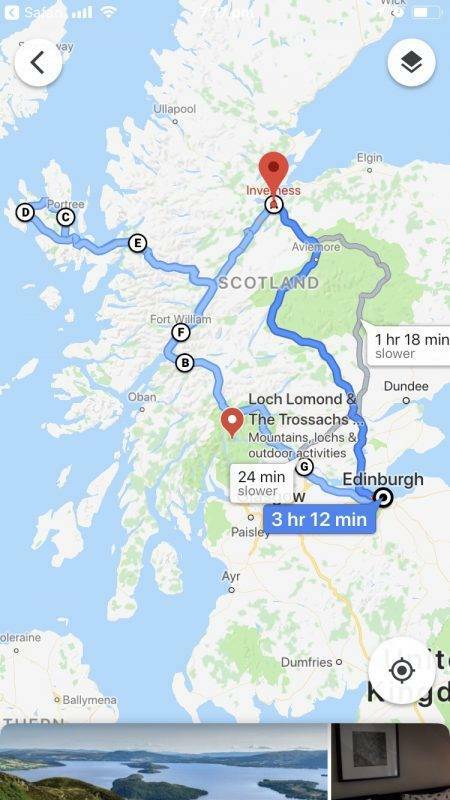 I done almost the exact same route on one of my visits to Scotland, perfect way to tour the country! Great itinerary and incredible pictures as well. The magical fairy pools are just brilliant. Love the tips, especially of downloading the off-line map. Road trips are fun and Scotland is on my list. This is an epic itinerary. I loved visiting Eilean Doolan Castle, as my family has connections to it. So stoked to see that you have included that in your list of things to see and do. 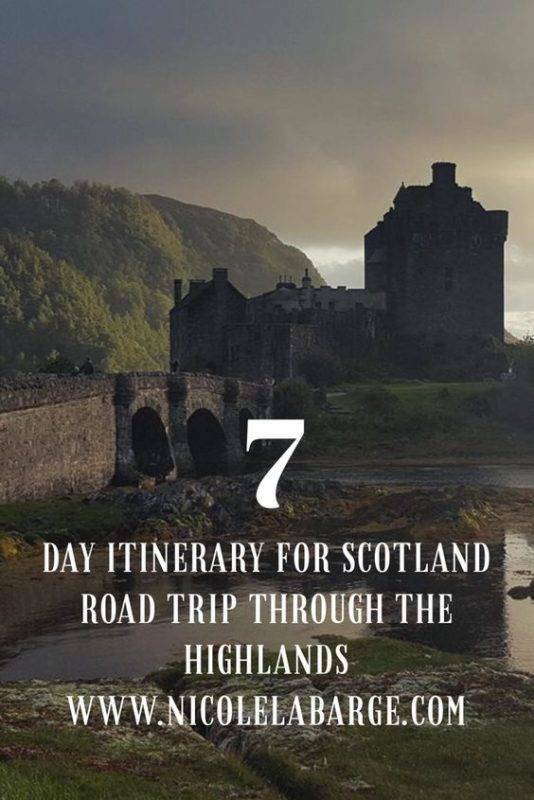 Though is 7 days enough time to really experience Scotland? This is such a neat and detailed itinerary. The fact that you displayed it on the map makes things so clear. If I were to visit Scotland I would definitely want to do it by car, like you did. I like to stop and take pictures whenever I find something nice and that’s only possible if you drive your own car. 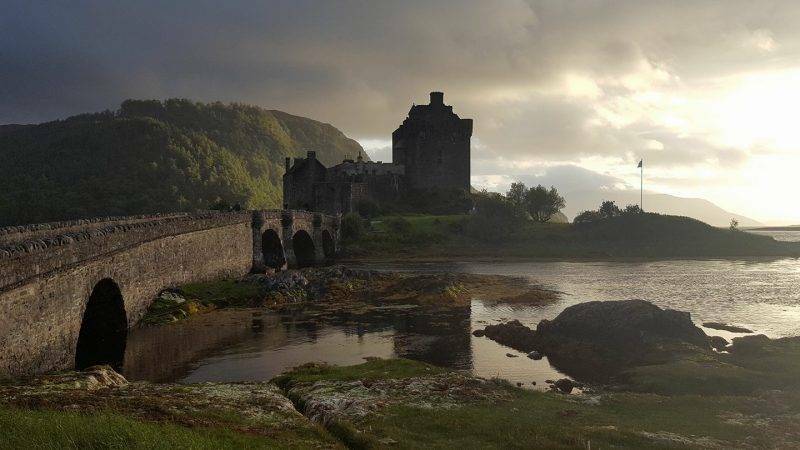 I can only imagine how lovely it must have been to stop at the Isle of Skye and admire that waterfall, or visit the picturesque Eilean Donan Castle. You made me want to go to Scotland very badly! The waterfalls and fairy pools look so spectacular! This article has some great tips, especially about making sure you give yourself sometime to shake the jet lag if you are traveling far to get to Scotland. Interesting that the ground feels spongy when you walk. I’m going to Scotland in a couple of weeks, I’m so excited! I only have time for a 5 day tour though, plus a couple of days in Edinburgh so I’m not sure how much we’ll get to see. Loch Ness and the Isla of Skye are definitely on the itinerary – I hope we can see those magical Fairy Pools!